Athens has always been famous for art and creativity. You only have to walk the streets to witness the imagination of the Ancient Greeks. But on a recent visit, I discovered some more modern examples of Greek creativity and artistic talent in the form of Athens street art. 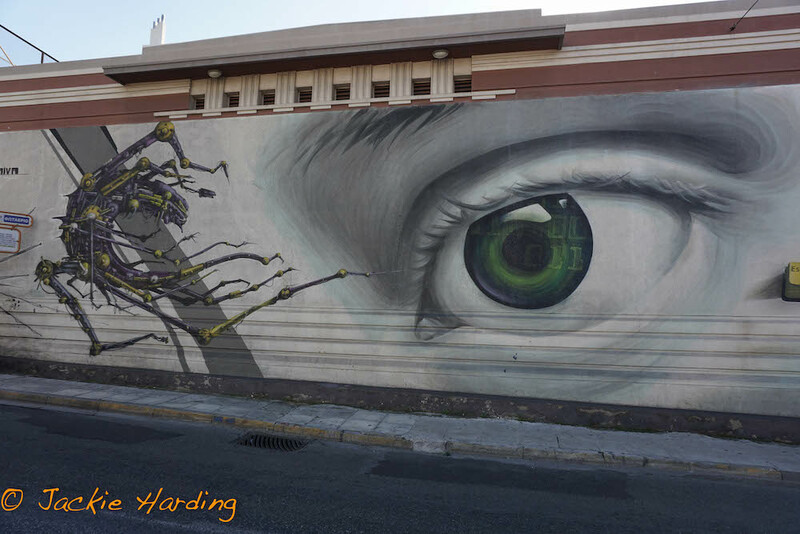 I discovered a very illuminating three-hour walking tour of Athens Street Art through Airbnb Experiences, run by Popi and Thomas. The guides provide insights into the artists whose works are on display as they take you to neighborhoods in Athens that you might not find alone, such as Gazi, Psyrri, Keramikos and Monastiraki. What is the difference between graffiti and street art? My understanding is that graffiti is more the unsanctioned written word and street art is art that is on streets rather than in galleries. Greece is not a stranger to graffiti on its crumbling buildings, but the trend now is political commentary by way of beautifully painted murals around the city, with some artists retaining the mystery of their identity. Athens art is driven by the economic crisis and the frustration felt by the citizens of Greece, and the city is now ranked No. 1 on some lists of the Top 5 Cities in Europe recognized for its street art along with Berlin, Lisbon, Bristol and Bucharest. • Many of the artists are homegrown such as INO, an internationally famous but anonymous artist. INO started as a graffiti artist aged 15, then studied at Athens School of Fine Arts. His stunningly huge murals focus on social injustice, the economy, war and poverty and always feature a splash of blue colour in the piece. • Another Athens based artist is Sonke and you’ll spot his curly haired girl all over Athens. The story goes that she broke up with the artist and in an attempt to get her back, he drew her face on the walls of her route to work. I’m not sure if it worked! • The aptly named Achilles paints in a fantasy style, usually a female’s face cleverly wrapped into a building. • Dreyk The Pirate, artist and illustrator, has scattered his amusing character around the city. His work was even in a major piece promoting Blood Donor Day in 2018. • Many of the artists featured on the walls of Athens are not Greek such as WD or Wild Drawing. WD was born in Bali, has degrees in Fine Arts and is currently based in Athens. He uses rollers and spray paint and interacts with the area he is working on, using doors and windows that become part of the mural. • Simoni Fontana, one of Greece’s female street artists, is inspired by Japanese manga-style art. • Alex Martinez, a U.S.-born artist, N_grams (Dimitris Naiplis), a Greek visual artist, and Smart created a stunning mural named “All Dogs Go To Heaven,” featuring Loukanikos, the Riot Dog, who became a symbol of the resistance to the austerity measures. • Dimitris Taxis created a powerful painting of a politician of the old order, drinking wine whilst the economy crumbled. • Pavlos Tsakonas created “Two Hands Clasped in Prayer,” in collaboration with Athens School of Fine Art and the Ministry of Environment Energy and Climate Change. Inspired by Dürer, the hands unusually point down into the city, as if praying to the inhabitants to make a difference in the fight to slow down climate change. • My final powerful piece is “Hope Dies Last,” by WD. The gaunt male face peers out of the doorway, and he appears shackled to the building. Maybe he represents the refugees stuck in the camps on some of the Greek islands or maybe he represents the Greeks shackled by their politicians to the country’s debt? Whatever the message, Athens artists are creating some amazingly beautiful and powerful political statements and breathing new life onto its crumbling walls. Jackie Harding was born in the United Kingdom. As a longtime expat, she’s lived in Boston for 12 years, and in the Netherlands for the past eight years. Trained as a nurse in the U.K., she worked for nine years in the United States for as a special education teacher’s assistant. Since moving to the Netherlands, she has discovered writing and photography. Writing for Dispatches since 2016, Jackie has written about her travels around Europe as well as about expat life and issues. She also covered Women’s March Amsterdam. She’s married to British businessman Martin Harding and is the mother of two international adult children. You can read more of Jackie’s work for Dispatches here.